September 13, 1983: Osborne Computer Corporation, one of Apple’s early rivals, declares bankruptcy. 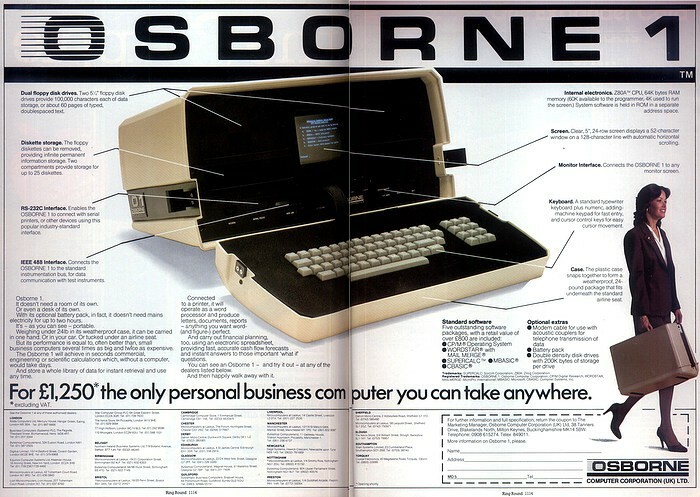 Many consider the company’s Osborne 1 the world’s first truly portable, full-featured computer. It packed everything users needed to set up shop at home or on the road. Alas, it doesn’t last! The Osborne 1 landed in June 1981, two months before International Business Machines Corporation released its IBM Personal Computer (thereby igniting the Apple-versus-IBM feud). Never intended to be the world’s most powerful computer, the Osborne 1 boasted multiple built-in floppy drives, with a maximum storage capacity of 91K each. A Zilog Z80 microprocessor powered the machine, which had a detachable keyboard with numeric keypad and a tiny, built-in, 5-inch monochrome display. In a neat touch, which Jony Ive would later use for Macs like the iMac G3, the Osborne 1 featured a carrying handle to make it easily transportable. In the end, a series of bad decisions on the part of founder Adam Osborne led to the company’s September 13, 1981, bankruptcy. Later that month, a group of investors filed suit against the company, looking for $8.5 million in damages for apparent insider trading. They also accused Osborne of covering up the company’s perilous financial situation. Osborne eventually came out of bankruptcy, but his company was never the same. Apple’s clash with the Osborne Computer Corporation is interesting as a historical footnote, but it goes further than that. In fact, it represented the first of many design-oriented philosophical disagreements that characterized every major rivalry Apple has since been involved in: Apple versus IBM, Apple versus Microsoft, Apple versus Google, and most recently Apple versus Samsung. A U.K. ad for the Osborne 1. The Osborne 1 computer was not great even by the standards of the day. But for a time, it sold well. The war was therefore between Apple’s perfectionist tendencies on one side and Osborne’s “good enough” attitude on the other. As with so many early personal computing rivalries, the main players in the Osborne-versus-Apple clash knew each other. Osborne himself was a regular attendee at Homebrew. He often wound others up at the meetings by endlessly talking about his upcoming machines. On one occasion, he pushed Jobs too far. It was a good quip. But by the time the Mac launched in 1984, Osborne’s time as a major threat to Apple’s success already had passed. Do you remember Osborne Computers? Leave your thoughts and comments below.